Before Juno, when we deploy Openstack in production, there always is a painful point about L3 Agent: High availability and performance bottleneck. Now Juno comes with new Neutron features to provide HA L3-agent and Distributed Virtual Router (DVR). 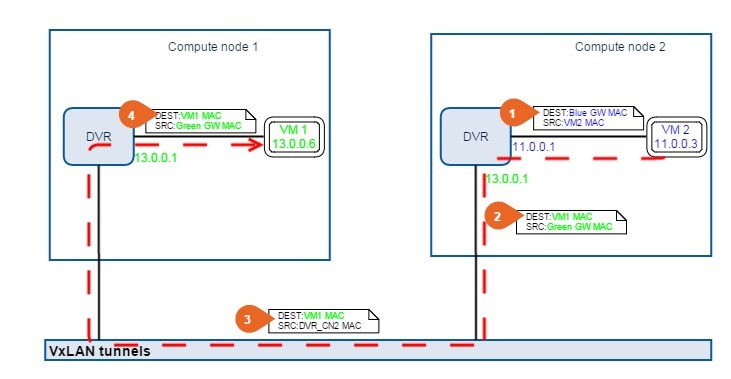 DVR distributes East-West traffic via virtual routers running on compute nodes. 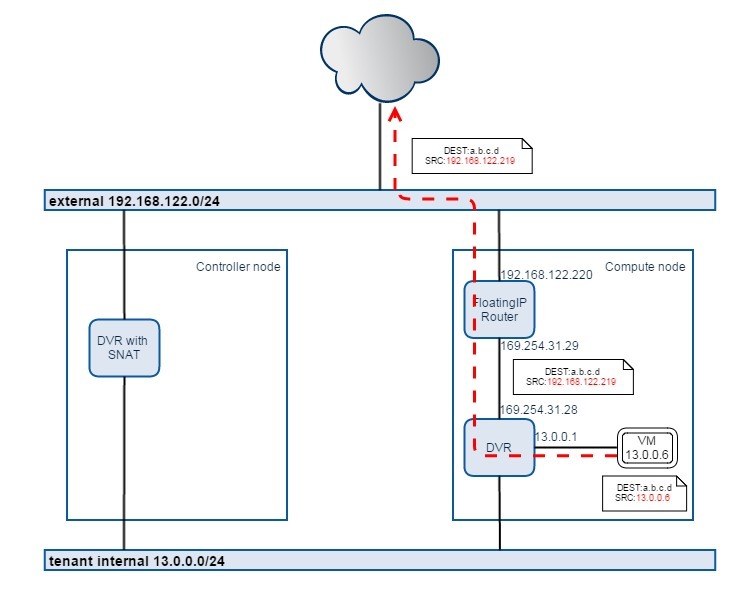 Also virtual routers on compute nodes handle North-South floating IP traffic locally for VM running on the same node. However if floating IP is not in use, VM originated external SNAT traffic is still handled centrally by virtual router in controller/network node. 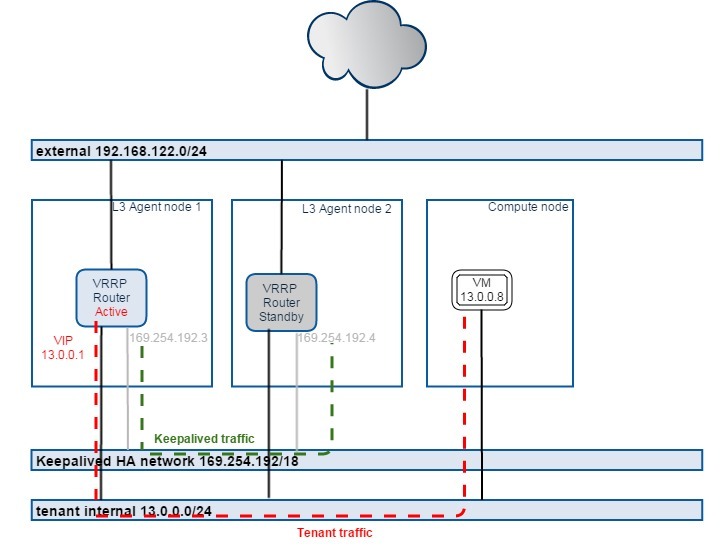 HA L3 Agent provides virtual router HA by VRRP. A virtual gateway IP is always available from one of controller/network node. DVR currently only supports tunnel overlays (VxLAN or GRE) with l2population enabled, VLAN as overlay is not supported yet. So to continue, we need a running Juno Openstack setup with VxLAN or GRE as overlay network configured. In my setup, RDO with RHEL7 is used to deploy a multi-node Juno setup, 1 controller and 2 compute nodes. Now we are ready to use DVR. 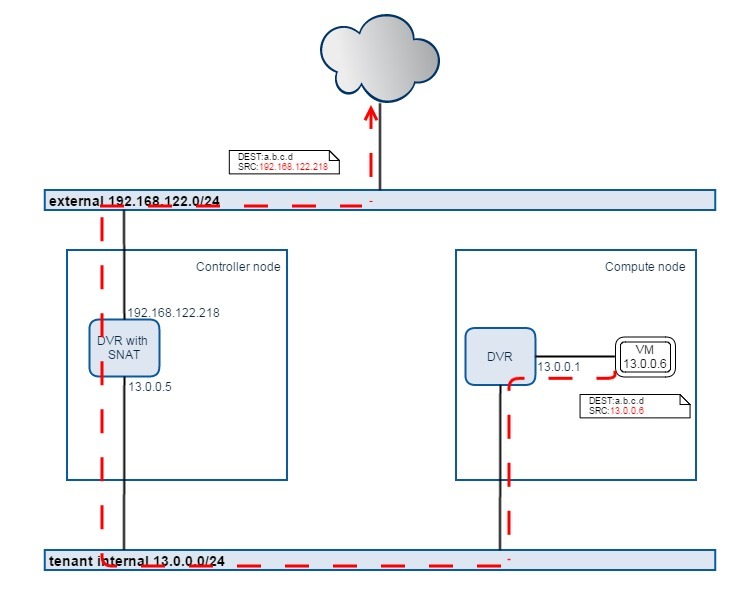 If a VM does not need floating IP, only needs outgoing external network access, then the traffic will still be handled by centralized SNAT on L3 agent running on controller node. Then launch a VM using this tenant network from dashboard. snat-db5090df-8385-4e42-a176-bec0ea9d6691 ip a |grep "inet "
We can see 3 network namespaces are created, this snat namespace is newly introduced by DVR, to handle SNAT iptables separately. In SNAT namespace, there is one internal IP 13.0.0.5 for receiving SNAT traffic from VMs, and one external IP 192.168.122.218 for SNAT. [[email protected] ~]# ip netns exec qrouter-db5090df-8385-4e42-a176-bec0ea9d6691 ip a | grep "inet "
We can see a new routing policy is created, to lead traffic from 13.0.0.1/24 to use routing table “218103809”, in routing table “218103809”, the default gateway is pointed to 13.0.0.5, which is the interface in centralized router handling SNAT traffic. qrouter-db5090df-8385-4e42-a176-bec0ea9d6691 ip a | grep "inet "
fip-e720244f-fd4f-4811-9435-4a48e13519f7  ip a | grep "inet "
We can see the floating IP 192.168.122.219 is created in DVR namespace, also NAT iptables entries in the same namespace, then we see there’s one more network namespace “fip-e720244f-fd4f-4811-9435-4a48e13519f7” is created, it’s acturally for routing the Floating IP traffic to external network. It acts a “FloatingIP router”, DVR and FloatingIP router are connected by a point-to-point network “169.254.31.28/31”. In DVR namespace, a new routing policy is created to lead traffic from this VM (13.0.0.6) to routing table 16, then in table 16, the default GW is pointed to FloatingIP router. In FloatingIP router namespace, the traffic will be routed out towards 192.168.122.1, the physical GW IP of the external network. Here we notice that the FloatingIP router consumes one external IP “192.168.122.220”, just for routing purpose. We can see 2 VMs in 2 tenant networks are running on 2 different compute nodes. We can see on each compute, they all have the same namespace for the router, in each namespace, the gateway IPs of internal and internal-2 tenant networks are there locally. Packet 1: Since routing needed, VM2 use MAC of its blue network gateway as destination MAC, self MAC as source MAC. Packet 3: Packet travelling in the tunnel still uses VM1 MAC as destination, but source MAC is changed to DVR MAC of compute node 2. Packet 4: Finally the packet reaches VM1, with of course VM1 MAC as destination, and the source should be the MAC of green network gateway. DVR MAC for each DVR router is involved to identify different DVRs from different nodes, because every DVR has same tenant network gateway IP and gateway MAC. Currently creating a distributed HA router is not supported yet, we have to disable DVR to make HA router working. To make L3 Agent HA, we need at least 2 L3 agent nodes, so here we make 1st compute node working as L3 agent node as well, to make L3 Agent HA working. Let’s check the neutron networks and ports of “harouter”, also router namespace on 2 L3 agent node. ip a |grep "inet "
[[email protected] ~]# ip netns exec qrouter-7422a91c-207e-42e7-b100-9164693b4c99 ip a |grep "inet "
qrouter-7422a91c-207e-42e7-b100-9164693b4c99 ip a | grep "inet "
We can see the router gateway VIP is up on 2nd L3 agent node. PING 13.0.0.1 (13.0.0.1) 56(84) bytes of data.